I've seen the phrase "sh compatible" used usually in reference to shells. I'm not sure if it also applies to the programs that might be run from within shells. What does it mean for a shell or other program to be "sh compatible"? What would it mean to be "sh incompatible"? I'd still like a direct answer to what it means to be "sh compatible". A reasonable expectation might be that "sh compatible" means "implements the Shell Command Language" but then why are there so many "sh compatible" shells and why are they different? Why are there so many "sh compatible" shells? The POSIX shell is based on the 1988 version of KornShell, which in turn was meant to replace the Bourne shell on AT&T Unix, leapfrogging the BSD C shell in terms of features.⁴ To the extent that ksh is the ancestor of the POSIX shell, most Unix and Unix-like systems include some variant of the Korn shell today. The exceptions are generally tiny embedded systems, which can't afford the space a complete POSIX shell takes. All this history explains why the creators of relative latecomers like bash, zsh, and yash chose to make them sh-compatible: Bourne/POSIX compatibility is the minimum a shell for Unix-like systems must provide in order to gain widespread adoption. A POSIX-certified shell. This is common in newer UNIX® systems, such as Solaris 11 (2010). The Almquist shell. This is an open source Bourne/POSIX shell clone originally released on Usenet in 1989, which was then contributed to Berkeley's CSRG for inclusion in the first BSD release containing no AT&T source code, 4.4BSD-Lite. The Almquist shell is often called ash, even when installed as /bin/sh. 4.4BSD-Lite in turn became the base for all modern BSD derivatives, with /bin/sh remaining as an Almquist derivative in most of them, with one major exception noted below. You can see this direct descendancy in the source code repositories for NetBSD and FreeBSD: they were shipping an Almquist shell derivative from day 1. The ash command in BusyBox, which is frequently used in embedded Linuxes and may be used to implement /bin/sh. Since it postdates dash and it was derived from Debian's old ash package, I've chosen to consider it a derivative of dash rather than ash, despite its command name within BusyBox. GNU Bash, which disables most of its non-POSIX extensions when called as sh. This choice is typical on desktop and server variants of Linux, except for Debian and its derivatives. Mac OS X has also done this since Panther, released in 2003. A shell with ksh93 POSIX extensions, as in OpenBSD. Although the OpenBSD shell changes behavior to avoid syntax and semantic incompatibilities with Bourne and POSIX shells when called as sh, it doesn't disable any of its pure extensions, being those that don't conflict with older shells. This is not common; you should not expect ksh93 features in /bin/sh. I used "shell script" above as a generic term meaning Bourne/POSIX shell scripting. This is due to the ubiquity of Bourne family shells. To talk about scripting on other shells, you need to give a qualifier, like "C shell script." Even on systems where a C family shell is the default interactive shell, it is better to use the Bourne shell for scripting. It is telling that when Wikipedia classifies Unix shells, they group them into Bourne shell compatible, C shell compatible, and "other." What would it mean to be "sh incompatible"? They are making a distinction between the Bourne and C shell families. They are talking about some specific feature in one Bourne family shell that isn't in all the other Bourne family shells. ksh93, bash, and zsh in particular have many features that don't exist in the older "standard" shells. Those three are also mutually-incompatible in a lot of ways, once you get beyond the shared POSIX/ksh88 base. It is a classic error to write a shell script with a #!/bin/sh shebang line at the top but to use Bash or Korn shell extensions within. 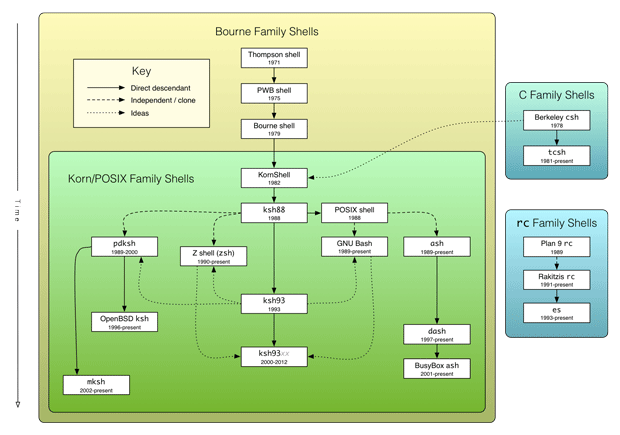 Since /bin/sh is one of the shells in the Korn/POSIX family diagram above on so many systems these days, such scripts will work on the system they are written on, but then fail on systems where /bin/sh is something from the broader Bourne family of shells. Best practice is to use #!/bin/bash or #!/bin/ksh shebang lines if the script uses such extensions. Run checkbashisms on it, a tool from the Debian project that checks a script for "bashisms." Run it under posh, a shell in the Debian package repository that purposely implements only features specified by SUS3, plus a few other minor features. Run it under osh from the Schily Tools project, an improved version of the Bourne shell as open sourced by Sun as part of OpenSolaris in 2005, making it one of the easiest ways to get a 1979 style Bourne shell on a modern computer. The Schily Tools distribution also includes bosh, a POSIX type shell with many nonstandard features, but which may be useful for testing the compatibility of shell scripts intended to run on all POSIX family shells. It tends to be more conservative in its feature set than bash, zsh and the enhanced versions of ksh93. Schily Tools also includes a shell called bsh, but that is an historical oddity which is not a Bourne family shell at all. Go through the Portable Shell Programming chapter in the GNU Autoconf manual. You may recognize some of the problematic constructs it talks about in your scripts. The improved version could only be improved by breaking backwards compatibility. Someone thought of a different way for something to work, which they like better, but which isn't the same way the old one worked. Someone tried reimplementing an old standard without completely understanding it, so they messed up and created an unintentional difference. Early versions of BSD Unix were just add-on software collections for V6 Unix. Since the Bourne shell wasn't added to AT&T Unix until V7, BSD didn't technically start out having the Bourne shell. BSD's answer to the primitive nature of the Thompson shell was the C shell. Nevertheless, the first standalone versions of BSD (2.9BSD and 3BSD) were based on V7 or its portable successor UNIX/32V, so they did include the Bourne shell. It is safe to say that the Bourne shell was everywhere in the Unix world by 1983. That's a good approximation to "forever" in the computing industry. MS-DOS got a hierarchical filesystem that year (awww, how cuuute!) and the first 24-bit Macintosh with its 9" B&W screen — not grayscale, literally black and white — wouldn't come out until early the next year. The Thompson shell was quite primitive by today's standards. It was only an interactive command shell, rather than the script programming environment we expect today. It did have things like pipes and I/O redirection, which we think of as prototypically part of a "Unix shell," so that we think of the MS-DOS command shell as getting them from Unix. The Bourne shell also replaced the PWB shell, which added important things to the Thompson shell like programmability (if, switch and while) and an early form of environment variables. The PWB shell is even less well-remembered than the Thompson shell since it wasn't part of every version of Unix. When someone isn't specific about POSIX vs Bourne shell compatibility, there is a whole range of things they could mean. At one extreme, they could be using the 1979 Bourne shell as their baseline. An "sh-compatible script" in this sense would mean it is expected to run perfectly on the true Bourne shell or any of its successors and clones: ash, bash, ksh, zsh, etc. Someone at the other extreme assumes the shell specified by POSIX as a baseline instead. We take so many POSIX shell features as "standard" these days that we often forget that they weren't actually present in the Bourne shell: built-in arithmetic, job control, command history, aliases, command line editing, the $() form of command substitution, etc. Although the Korn shell has roots going back to the early 1980s, AT&T didn't ship it in Unix until System V Release 4 in 1988. Since so many commercial Unixes are based on SVR4, this put ksh in pretty much every relevant commercial Unix from the late 1980s onward. 1988 is also the year the first POSIX standard came out, with its Korn shell based "POSIX shell." Later, in 1993, an improved version of the Korn shell came out. Since POSIX effectively nailed the original in place, ksh forked into two major versions: ksh88 and ksh93, named after the years involved in their split. Systems that include a Korn shell as a separate thing from the POSIX shell usually make it available as /bin/ksh, though sometimes it is hiding elsewhere. When we talk about ksh or the Korn shell by name, we are talking about ksh93 features that distinguish it from its backwards-compatible Bourne and POSIX shell subsets. You rarely run across the pure ksh88 today. AT&T kept the Korn shell source code proprietary until March 2000. By that point, Linux's association with GNU Bash was very strong. Bash and ksh93 each have advantages over the other, but at this point inertia keeps Linux tightly associated with Bash. As to why the early Linux vendors most commonly choose GNU Bash over pdksh, which was available at the time Linux was getting started, I'd guess it's because so much of the rest of the userland also came from the GNU project. Bash is also somewhat more advanced than pdksh, since the Bash developers do not limit themselves to copying Korn shell features. Work on pdksh stopped about the time AT&T released the source code to the true Korn shell. There are two main forks that are still maintained, however: the OpenBSD pdksh and the MirBSD Korn Shell, mksh. I find it interesting that mksh is the only Korn shell implementation currently packaged for Cygwin. GNU Bash goes beyond POSIX in many ways, but you can ask it to run in a more pure POSIX mode. csh/tcsh was usually the default interactive shell on BSD Unixes through the early 1990s. Being a BSD variant, early versions of Mac OS X were this way, through Mac OS X 10.2 "Jaguar". OS X switched the default shell from tcsh to Bash in OS X 10.3 "Panther". This change did not affect systems upgraded from 10.2 or earlier. The existing users on those converted systems kept their tcsh shell. FreeBSD claims to still use tcsh as the default shell, but on the FreeBSD 10 VM I have here, the default shell appears to be one of the POSIX-compatible Almquist shell variants. This is true on NetBSD as well. OpenBSD uses a fork of pdksh as the default shell instead. The higher popularity of Linux and OS X makes some people wish FreeBSD would also switch to Bash, but they won't be doing so any time soon for philosophical reasons. It is easy to switch it, if this bothers you. It is rare to find a system with a truly vanilla Bourne shell as /bin/sh these days. You have to go out of your way to find something sufficiently close to it for compatibility testing. I'm aware of only one way to run a genuine 1979 vintage Bourne shell on a modern computer: use the Ancient Unix V7 disk images with the SIMH PDP-11 simulator from the Computer History Simulation Project. SIMH runs on pretty much every modern computer, not just Unix-like ones. SIMH even runs on Android and on iOS. With OpenSolaris, Sun open-sourced the SVR4 version of the Bourne shell for the first time. Prior to that, the source code for the post-V7 versions of the Bourne shell was only available to those with a Unix source code license. That code is now available separately from the rest of the defunct OpenSolaris project from a couple of different sources. The most direct source is the Heirloom Bourne shell project. This became available shortly after the original 2005 release of OpenSolaris. Some portability and bug fixing work was done over the next few months, but then development on the project halted. Jörg Schilling has done a better job of maintaining a version of this code as osh in his Schily Tools package. See above for more on this. Keep in mind that these shells derived from the 2005 source code release contain multi-byte character set support, job control, shell functions, and other features not present in the original 1979 Bourne shell. One way to tell whether you are on an original Bourne shell is to see if it supports an undocumented feature added to ease the transition from the Thompson shell: ^ as an alias for |. That is to say, a command like ls ^ more will give an error on a Korn or POSIX type shell, but it will behave like ls | more on a true Bourne shell. Occasionally you encounter a fish, scsh or rc/es adherent, but they're even rarer than C shell fans. 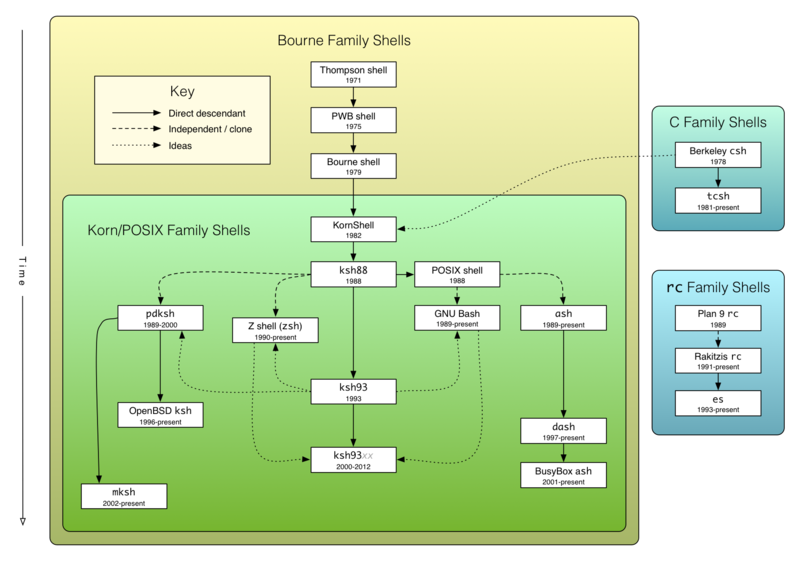 The rc family of shells isn't commonly used on Unix/Linux systems, but the family is historically important, which is how it earned a place in the diagram above. rc is the standard shell of the Plan 9 from Bell Labs operating system, a kind of successor to 10th edition Unix, created as part of Bell Labs' continued research into operating system design. It is incompatible with both Bourne and C shell at a programming level; there's probably a lesson in there. The most active variant of rc appears to be the one maintained by Toby Goodwin, which is based on the Unix rc clone by Byron Rakitzis. "sh compatible" refers to POSIX sh, the basic shell that is required to exist on all compatible systems. A sh-compatible script should work on any POSIX-compatible machine. The reason it's necessary to say so is that commonly /bin/sh is a symlink to /bin/bash, which has let some Bashisms slip into scripts that declare themselves to use sh with #!/bin/sh. These scripts fail to work on systems that don't use bash as /bin/sh, including some commercial Unices forever, and Debian and derivatives recently. In particular there's been a trend to use dash, the Debian Almquish Shell, as the default sh lately, because it's smaller and meant to be faster. That trend has highlighted a lot of those Bashisms that were in supposed sh scripts. Describing something as "sh compatible" indicates that it's explicitly intended to work with these systems by staying entirely within the POSIX-specified language — all shells will implement a superset of that functionality, so it's guaranteed to work everywhere, but their extensions aren't compatible with one another. Different shells have their own development histories and diverged in different directions over time, as they added functions to help interactive use for their users, or scripting extensions like associative arrays. A "sh-incompatible" script would use some of these non-standard extension features, like Bash's [[ conditionals. The non-POSIX features in bash and tcsh and zsh and all of the other current shells are useful, and there are plenty of occasions where you might want or need them. They just shouldn't be used in a script that declares itself to work with /bin/sh, because you can't rely on those features being in the base sh implementation on the system you're running on. That will work anywhere with bash. Scripts that don't need the extended functionality and are meant to be portable should declare that they use sh and stick to the base shell command language. Not the answer you're looking for? Browse other questions tagged shell compatibility or ask your own question. What is the difference between ~/.profile and ~/.bash_profile? Are there still systems around with a /bin/sh binary? What is the fastest way to run a script? How complex can a program be written in pure Bash? Object oriented Unix shell with at least LINQ capabilities? What is the rationale for the bash shell not warning you of arithmetic overflow etc.? What is the difference between shell builtins and shell keyboard shortcuts?